There is a Microsoft ASP.NET way to do bundling now, as well as the ServiceStack Bundler project, which uses node.js . However, that also has some dependency on ASP.NET MVC code. Thus, static files will not work. The task runner need to run during design time, and probably build/deploy time as well. Then we can figure out later how to make it easier to use in Visual Studio and MSBuild. OK, i installed Node and npm, the Node.js package manager. Think of node of being it’s own platform with its own infrastructure, its own EXE, and its own set of installable packages. NPM is how you install packages. According to the getting started page, we install grunt-cli via NPM. Seems to have installed some dependent libs i know nothing about. No prob. This is a global install on your machine. It seems you will also have to install it per project using npm “devDependiencies” with the –save-dev flag. More on that later. Global installs are for command-line utilities. If you are using client-side libs, you install them or require() them in your project. You can do this with no IDE by creating an empty directory and start there. But since my team uses Visual Studio, i will create an empty ASP.NET web app and install there manually. In VS 2013, Add New Projects, ASP.NET , name it, and select the “Empty” template. That will create the minimal project. For kicks, add a static HTML file for testing later. Right-click the project, Add -> HTML page. Call it index.html. In the Node command prompt (doesn’t have to be Administrator mode), cd to your project directory (not the solution directory). This will install the Node infrastructure to the project as a /node_modules/ directory. I recommend clicking the “View All Files” button in Solution Explorer and also clicking the “Refresh” button. This will show you the files not tracked by VS, but in the directory. 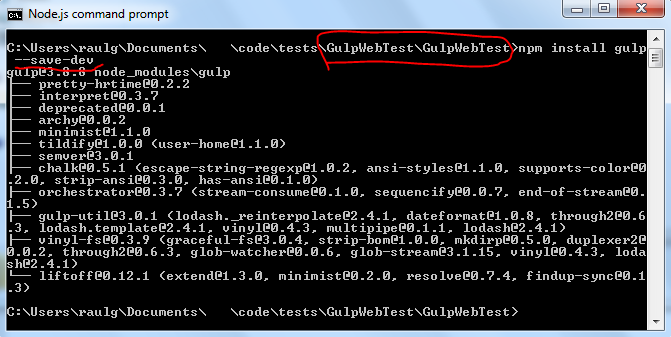 Now on the command line, you can run the default ‘gulp’ command, which will do nothing. The point of using a JS build tool is including other JS libraries in your project, for use at build time or run time. So for the sake of proof-of-concept, i will install the uglify lib (for minification), concat to bundle all js scripts, and the JQuery lib (for use in our client-side scripts). There is a special gulp-uglify plugin (a bunch of others too), so we install that in the same way with npm. I will install the standard JQuery lib as well. 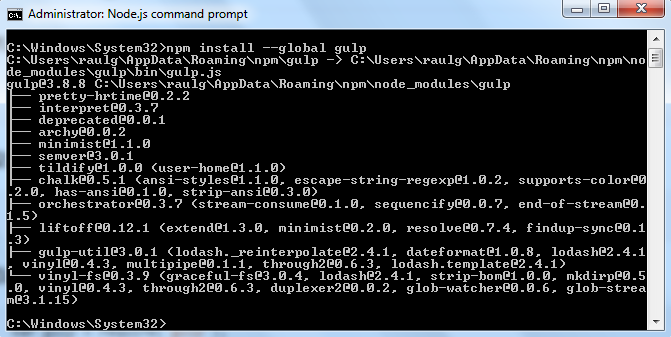 Note i can use NPM to install it, or i could have it Microsoft-style and install using NuGet. The only difference would be the path to the *.js files in the project. I’m going to create a /scripts/app.js file which does a simple jQuery DOM manipulation. Also, the index.html file will reference/run the app.js and jquery scripts. Note i’ve created a new ‘scripts’ task, which is added as a dependent task to the ‘default’ task. The ‘scripts’ task is using the jquery.js file and all the *.js files in the /scripts/ directory as sources. They all go thru concat(), output to main.js , in the dist/js/ directory. They then go thru uglify(). In Solution Explorer, you can refresh and now see the /dist/js/main.js file which was created. It should contain our custom js code as well as the whole jQuery. When you run the same index.html in the browser, you should get the same “jQuery changed this.” output, even though the only js file is ‘main.js’. The output main.js is only 83K. I’m sure it could get smaller if we use gzip, etc. But it proves the concept works. It should be very easy to add other JS modules as needed. The downside is installing this stuff to the project added 2,000 files under /node_modules/, adding about 12MB. Possibly much more full-featured and useful is the “Task Runner Explorer” VSIX extension. This is basically “real” tooling support in VS. I haven’t tried it yet, but i expect to try it. Update: I installed the Task Runner Explorer per the article above. It does work to view/run targets in the Gulpfile.js, so you don’t have to run on the command line, or have to build to execute the tasks. Continuous Deployment goes a step further than Continuous Integration, but based on the same principle: the more painless the deployment process is, the more often you will do it, leading to faster development in smaller, manageable chunks. As a C#/ASP.NET developer deploying to an IIS server, the go-to tool from Microsoft is MSDeploy (aka WebDeploy). 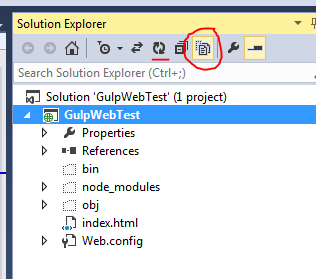 This article primarily discusses steps in Visual Studio 2010, Web Deploy 2.0, and TeamCity 7.1. I have read numerous articles which explain using Git w/TeamCity and MSBuild, but not so much specifically with MSDeploy. I’ll go thru the steps in detail (except test running, which is important, but a separate focus). Configuration: Active (Debug) – this means the ‘Debug’ config is active in VS, and you are editing it. The ‘Debug’ and ‘Release’ configurations both can be selected and independently edited. 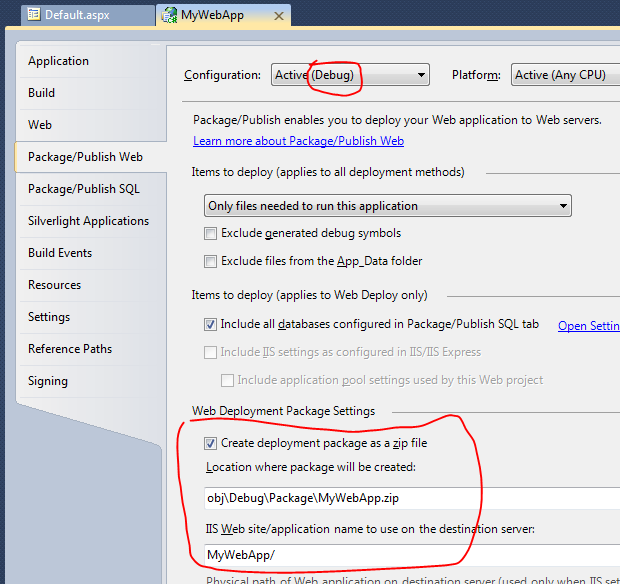 Web Deployment Package Settings – check “Create deployment package as zip file”. We want the ZIP file so it can be deployed separately later. IIS Web Site/application name – This must match the IIS Web site entry on the target server. Note i use “MyWebApp/” with no app name after the path. 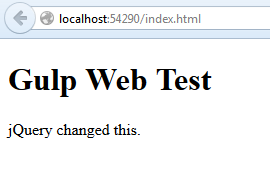 That is how it looks on the web server config. Save it with your project, and make sure your changes are checked into Git (pushed to origin/master). Those settings will be pulled from version control when the CI server runs the build steps. 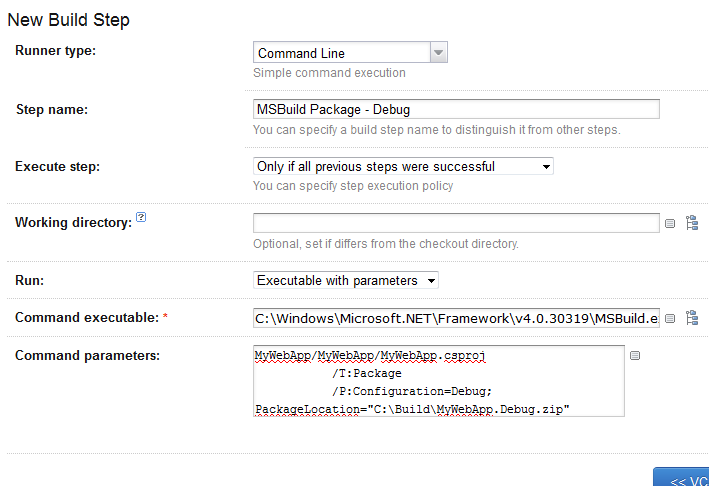 I edit the Build Steps, and add a second build step, to build the MyWebApp.sln directly, using msbuild. C:\TeamCity\buildAgent\work\be5c9bc707460fdf\MyWebApp\MyWebApp\MyWebApp.csproj(727, 3): error MSB4019: The imported project “C:\Program Files (x86)\MSBuild\Microsoft\VisualStudio\v10.0\WebApplications\Microsoft.WebApplication.targets” was not found. Confirm that the path in the <Import> declaration is correct, and that the file exists on disk. Basically, either we need to install VS on the build server, manually copy files, or install the Microsoft Visual Studio 2010 Shell (Integrated) Redistributable Package. I’m going to try door #3. After installing the Microsoft Visual Studio 2010 Shell (Integrated) Redistributable Package on the build server, i go back in TeamCity and click the [Run…] button, which will force a new build. I have to do this because nothing changed in the Git source repository (i only installed new stuff on the server), so that won’t trigger a build. Luckily, that satisfied the Web App build– success! Looking in the build log, i do see it built MyWebApp.sln and MyWebApp.dll. So build is good. Still no deployment to a server yet. I get the Web Deployment Tool here and install. After reboot, the TeamCity login has a 404 error. Turns out Web Deploy has a service which listens on port 80, but so does TeamCity Tomcat server. For short term, i stop the Web Deploy web service in control panel, and start the TeamCity web service. The purpose of the Web Deployment Agent Service is to accept requests to that server from other servers. We don’t need that, because the TeamCity server will act as a client, and deploy out to other web servers. The Web Deployment Tool also has to be installed on the target web server. I’m not going to go too far into detail here, but you have to configure the service to listen as well, so when you run the deployment command, it accepts it and installs on the server. For the development server, i set up a new account named ‘webdeploy’ with permission to install. For production web servers, i’m not enabling it yet, but i did install Web Deploy so i can do a manual run on the server using Remote Desktop (will explain later). This is a package and deploy in one step. However, i opted for a different path – separate steps for packaging and deployment. This will allow cases for building a Release package but manually deploying it. Try using the “Debug” config. That will use our dev server web.config settings. XML transformations in Web.Debug.config get applied to Web.config during the MSBuild packaging (just as if you ran ‘Publish’ in Visual Studio). MyWebApp.csproj : path to VS project file to build. There are important options in there which get set from the project Properties tabs. /P:Configuration=Debug;PackageLocation=*** : run the Debug configuration. This is the same as Build in Visual Studio with the ‘Debug’ setting selected. The ‘Package Location’ is what it created. We will reference the package file later in the deployment command. I tested this command running on my local PC first. When it was working, i ran the same on the CI server via Remote Desktop (for me, it’s a remote Windows 7 instance). 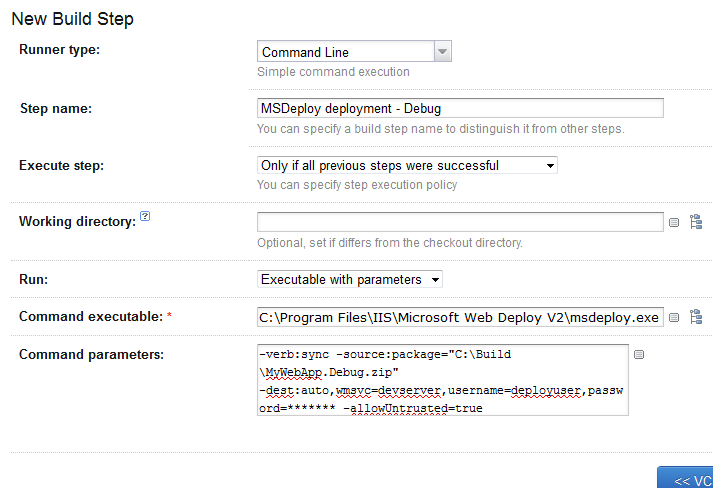 MsDeployServiceUrl – we’ll have to configure the development web server with Web Deploy service. -dest:auto,wmsvc=devserver : use the settings in the package file to deploy to the server. The user account is an OS-level account with permission (i tried IIS users, but didn’t get it working). The hostname is specified, but not the IIS web site name (which is previously specified in the MSBuild project file in the project properties). After deployment, i checked the IIS web server files, to make sure they had the latest DLLs and web.config file. Note – there is a special TeamCity MSBuild option, but i went with the command-line runner, just because i already had it set. In this case, i had to use the command-line runner, since there is no MSDeploy option. When you run the build with these steps, if they succeed, we finally have automatic deployment directly from git! You can review the logs in TeamCity interface after a build/deployment, to verify everything is as expected. If there are errors, those are also in the logs. Now every time new code gets merged and pushed to git origin/master branch, it will automatically build and deploy the the development server. Another benefit is that the installed .NET assemblies will have version numbers which match the TeamCity build number, is you use the AssemblyInfo.cs patcher feature. It will dramatically reduce the time needed to deploy to development – just check in your code, and it will build/deploy in a few minutes. This entry was posted in General and tagged msbuild, msdeploy, teamcity on January 10, 2013 by raulg.